Metal Design Systems began working with Nordstrom Rack on their facility branding program in Summer of 2013. The first challenge was addressing the many non-prototypical sites with differing architectural features, while providing the same consistency of their brand from site to site. Utilizing Exact+Site™ 3D Laser Scan, Metal Design is able to provide consistent aesthetics of the brand features on every site, ensuring consistency by providing 3D models of the “as built” site with the ACM, ribbons, canopy, and signage in place prior to fabrication. Exact+Site™ is a key component to the precision fit and finish for the brand. 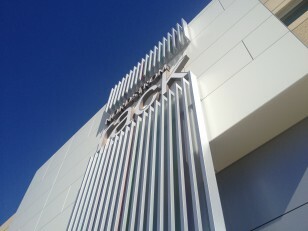 Another challenge was to provide efficient solutions for the production and installation of the ribbon element, the main brand feature for the new Nordstrom Rack façade. The ribbons are free spanning up to 30 feet with and typically include a space for the signage. They have lighting features and a ribbon base which is needed to carry the live and dead loads of the feature. 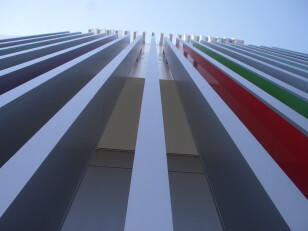 The vibrant colors of each ribbon needed to be visible from the entry side of the storefront only, and to have adaptability, so colors can be changed as desired. Metal Design Systems brought the solution for the ribbon feature challenge by designing a custom snap in place extrusion as well as an extruded color strip for the vibrant colors. A custom base was developed to engage the ribbon extrusions with a removable access panel for the lighting elements. A complete storefront prototype was built by MDSI at our corporate office for the Nordstrom Rack and designers to make final selections. The finalized facility brand image for Nordstrom Rack includes a custom 24” truss system with MDSI Series 20 Rainscreen which is used for the white ACM above a custom cantilever canopy and the featured ribbon element. The MDSI Series 44 Rainscreen in silver metallic panels was used for the lower portion of the store front. 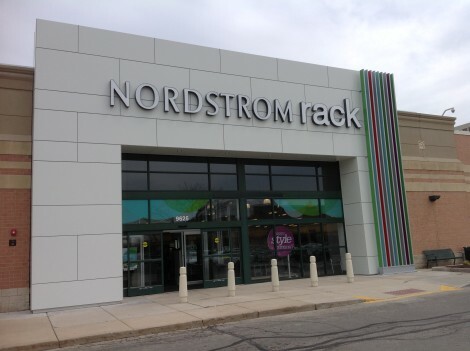 Metal Design Systems is the exclusive manufacturer for Nordstrom Rack and provides full support from design intent drawings, design assistance, laser scanning, manufacturing and installation/general contractor field support.